NYCHA’s Margarita Lopez speaks to the residents of NYCHA developments. 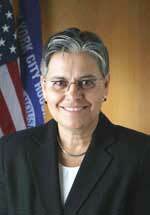 Margarita Lopez is a NYCHA (New York City Housing Authority) Board member, appointed in 2006 by Mayor Bloomberg. In 2007, her role was elevated to Environmental Coordinator, a position in which she is responsible for leading NYCHA’s green initiatives. Advocating for causes even before coming to the United States in 1978, Margarita Lopez is a passionate individual who knows how to promote and achieve change where it’s necessary. She is both a feminist and out lesbian, and has worked with a number of public officials, organizations, and communities throughout the years. Lopez has overseen the formation of the Energy Conservation and Environmental Sustainable (“Green”) Committee, and has worked tirelessly to restructure NYCHA buildings to be more sustainable. Since her time with NYCHA, Margarita Lopez has overseen the planting of 11,000+ trees on NYCHA property, the opening of green spaces like the NYC Planters Grove, and the organization’s carbon footprint has already started to decrease. A strong proponent for many causes, Margarita Lopez believes that, “the only way NYCHA and the rest of humankind can resolve its problems is to work together.” Ever dedicated to making the world a better place to live in, she has been an activist on many fronts: supporting women in domestic violence situations, protecting the rights of mentally ill and drug dependent people, helping the homeless, encouraging “green” lifestyles and businesses, promoting LGBT rights, and more. If there ever was a person who cared about humanity as a whole, NYCHA’s Margarita Lopez sure fits the mold. She knows the value of standing up for what’s right and advocating for communities in need.